NORTHERN MINDANAO, Philippines — In the midst of the severe flooding brought on by tropical storm Washi, Analiza Tumanda was resigned to the idea of giving birth on the rooftop of a neighbour’s house. But as raging floodwaters started sweeping away houses along the banks of Cagayan River, Analiza, her husband and their three children (ages 8, 6 and 3) were forced to flee, moving from one rooftop to anotheralong with neighbours. Although she was in her ninth month of pregnancy, she hadn’t expected to delivery any day soon. But the fear, anxiety and physical stress exacted their toll, and her labour pains started. Several minutes later, policemen arrived onboard a pump boat, and they rushed her to the nearest village health station that was still safe from the rising water. Soon after, she delivered a healthy baby girl, who was later nicknamed Sendang, the female version of the storm’s local name Sendong. Analiza is one of the more than 4,000 pregnant and lactating women reached so far by UNFPA in its relief efforts to assist storm survivors in Northern Mindanao and Eastern Visayas regions in southern Philippines. The UN estimates some 10,000 pregnant and lactating women and around 20,000 young people aged 10 to 25 have been affected by the floods in the cities of Cagayan de Oro and Iligan and in the provinces of Bukidnon, Lanao del Sur and Negros Oriental. In total, about 135,000 families or 650,000 individuals were affected by the disaster, with 553,000 people left homeless. Some 4,600 families or 23,000 people remain in evacuation or relocation sites, with the rest seeking shelter outside the camps. The UNFPA assistance includes distribution of dignity kits to all pregnant and lactating women, clean delivery kits to women in their third trimester of pregnancy, and special medical missions designed to reach pregnant and lactating women and their infants. The dignity kits, containing 18 items for basic sanitary supplies such as soap, a bath towel, toilet paper, sanitary pads, and other items, are distributed to protect the women and their babies from disease and infection. They are packed in acovered plastic bucket that can later be used to store clean water. Blankets and additional underwear are also provided. UNFPA has also designed a personal hygiene kit for young people, with contents, such as combs, toothpaste and deodorant, that were requested by the young people themselves. The clean delivery kits, meanwhile, are intended for use in case of an emergency childbirth outside a birthing facility. These are given only to pregnant women who are in their final three months of pregnancy. Miraflor Cainoy, 31, one of the recipients of the clean delivery kits during the early phase of the humanitarian response, is now sheltered at the Calaanan Tent City. She had given birth on January 11 and happily narrated that she did not forget to bring with her the clean delivery kit she received from UNFPA when her husband took her to a birthing centre. “Having the kit with me somehow gave me a sense of security that my baby and I will be okay. The kit was used by the doctor and midwife who assisted me during my delivery,” said the new mother of a baby girl, the third child in the family. Beyond the distribution of the kits, UNFPA continues to conduct medical missions in evacuation centres and relocation sites for flood survivors. So far 23 medical missions have been conducted in Cagayan de Oro, Iligan, and in the municipality of Bubong in Lanao del Sur. As part of the medical missions, a series of health information sessions are also conducted, focusing on specific topics such as safe motherhood, prevention of sexually transmitted infections, family planning, prevention of violence against women and life skills for young people – all in the context of a humanitarian situation. When the medical mission reached the evacuation centre where Analiza and her family are temporarily sheltered, she expressed relief as she said they haven’t been seen by a doctor since she gave birth. “Except for minor ailments such as colds, my baby is fine but I still want her to get checked. I am also worried about getting pregnant again because of our current condition so I want to avail of family planning services also,” she said after attending the health information session. The UNFPA achieved a milestone in the humanitarian assistance with the creation of the reproductive health and sexual and gender-based violence prevention sub-clusters within the UN’s cluster approach in humanitarian response. Through the persistent work of the sub-clusters, issues and concerns about pregnant and lactating women were mainstreamed in the humanitarian assistance. In the allocation of spaces in the temporary relocation sites called the Tent Cities, the Department of Social Welfare and Development included families with pregnant and lactating women in the list of priority beneficiaries. Subsequently, women-friendly spaces were also accommodated in relocation sites and evacuation centres. These women-friendly spaces are envisioned to be a space where women can access information and services on such concerns as maternal health and cases of gender-based violence. They also serve as a centre for initiating income-generating programmes. Discussions have begun on a cash-for-work programme specifically designed to provide livelinhoods for pregnant and lactating women. UNFPA attributes the successful advocacy for the welfare of pregnant and lactating women to the partnerships forged with various organizations. Some have been around for years, while others merely started at the early phase of the emergency. In the aftermath of the disaster, UNFPA mobilized youth volunteers from the Family Planning Organization of the Philippines (FPOP) in Cagayan de Oro City and the UNFPA Youth Peer Education Network (Y-PEER) in Iligan City to identify pregnant and lactating women in the evacuation centres, which allowed the UNFPA to prepare for finely tuned response. The youth volunteers’ role, however, did not end there. During medical missions and distribution of dignity kits, they continued to provide support. Rain or shine, they visited evacuation centres explaining the use of the kits, carrying the kits for the mothers, and engaging young people in focus group discussions. Medical mission performed on a mother affected by the distaster. “Some of our members were also affected by the disaster but we are thankful that we are still standing. We can only express our gratefulness by assisting those who were hit the hardest,” says Renie Paja, the youth representative of FPOP. 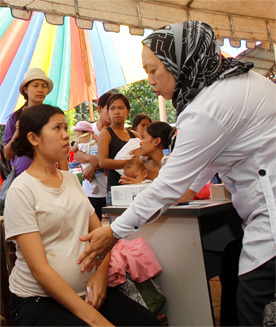 The conduct of the medical missions was made possible through the active participation of numerous government agencies and private organizations, such as the Department of Health, Department of Social Welfare and Development, Philippine National Police, Department of Justice, Commission on Human Rights, Philippine Obstetrical and Gynecological Society-Northern Mindanao Chapter, Integrated Midwives Association of the Philippines, Family Planning Organization of the Philippines, Iligan Society of Gynecologists, Touch Foundation, Iligan Medical Society, Save the Children, Philippine Nurses Association-Iligan Chapter, Akbayan Youth, Association of Deans of Nursing Schools in Iligan and Barangay Health Workers. Dr. Maria Imelda Carbajal, president of POGS-Northern Mindanao, said the medical missions have become part of the organization’s community outreach. “We conduct annual surgical and medical missions for free in various areas in Northern Mindanao. But for now, our focus will be in these medical missions for the mothers affected by the disaster,” she said.